Interested in Atlatl Boys: Awakening Our Human Blueprint? Deposit of $150 due with registration. Remaining balance can be split into 1 monthly payments of $720. *New twelve to fourteen year olds will be asked to interview before being included in this program. Starting in October, ending in May. $870. Sibling discount and payment plans available. Please inquire about financial aid. This monthly program for 9–14 year old boys will challenge, excite and deepen connections to nature, self and community. 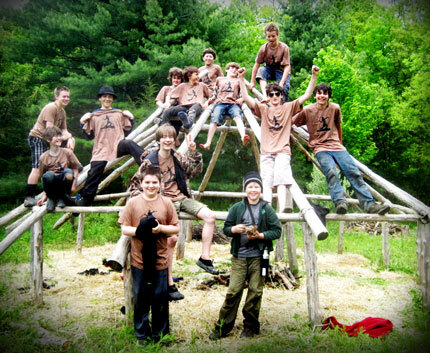 Atlatl is held by young men, fathers, teens and elders working together to create projects, challenges and adventures that awaken a part of our human blueprint. 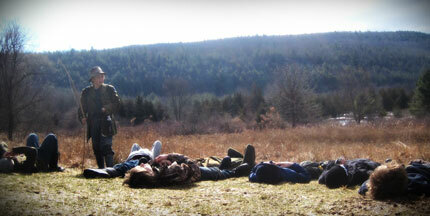 Pronounced “at-lattle,” Atlatl Boys provides an energetic, social and creative time for the emerging adolescent boy. Each month the boys will be met with opportunities to strengthen their bodies, learn and develop skills and have new and fun experiences with young adult mentors, mature men and other boys their age. Through wilderness skills and group challenges boys develop empowered self-reliance as well as the ability to serve as part of a team. Nature serves as a powerful teacher of bravery, interconnected relationship, inner-resilience, and inspiration. Tracking, stalking, friction fire, tool-making, bird language, shelter-building, story, song, and more are tools to create caring and awake young adults. Eighth graders are invited to return to Atlatl for their crowning year of Atlatl! Returning for a final year of Atlatl is a great way to continue developing your Wild Earth toolkit and an important step towards preparing for a wilderness-based rite of passage/solo experience. Eighth graders will be given special challenges, responsibilities and opportunities to stretch themselves. If they so choose, they will help out with the youngest group in the program, where they will hone their skills as CITs. The role of each 8th grader will be customized according to his interests and goals. Is your teen interested in becoming a CIT at Summer Camp? Joining as a participant will fulfill the volunteer time required to apply as summer camp CIT, since CIT practice time will be built in throughout the program. New twelve to fourteen year olds will be asked to interview before being included in this program. 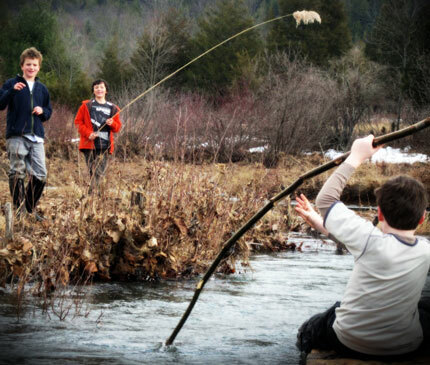 At Atlatl we mix guided play-based learning with structured skill-building activities to help boys develop into capable, empowered, young men, supported by their connections to nature, self, peers and mentors. Boys are given opportunities to learn and develop skills, test themselves in exhilarating situations and have new and fun experiences with mentors and other boys their age. Our activities include a wide variety of team-building games, which require boys to flex their decision-making muscles, voice their ideas, and cultivate a plethora of leadership capacities, including awareness and sensory acuteness, self-care and care of others, quiet mind and patience, cooperation, empathy and embracing differences, puzzle solving, detecting patterns and tracking changes, and healthy assertiveness. Atlatl will meet one Saturday per month beginning in the fall with an overnight in the spring. What does Atlatl mean anyway? The name Atlatl (aht-latl) comes from the Aztec language meaning extended arm. Though Cortez and his men called them estólica (spear-throwers) and feared them for their ability to puncture their chain mail and cotton armor. The oldest version of the Atlatl tool was used over 30,000 years ago to hunt mammoths, and is still a used today by the people of New Guinea and the Australian Aborigines. Other modern day uses of the Atlatl include spear throwing for sport, with awards for both distance and accuracy. The farthest recorded throw was around 850 feet. To us, the Atlatl represents a symbolic extension of our own arms into the natural world, into our communities, into our ancestry and history, and into the youth, allowing us to propel ourselves further than we could possibly hope to alone.